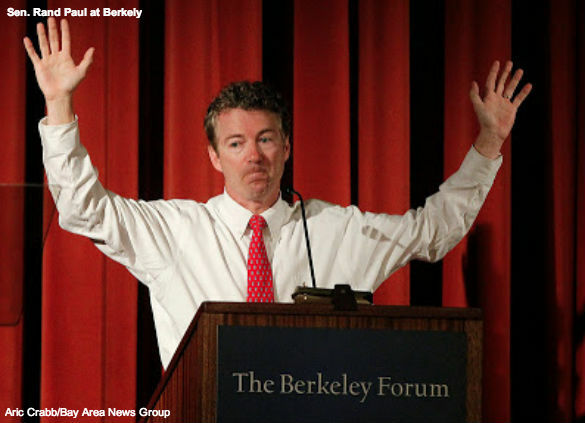 Senator Rand Paul accomplished a feat that, as far as Google could tell us, no other Republican has accomplished in years; he received a standing ovation at the University of California at Berkeley. Most Americans who follow the news, and certainly most conservatives, will recognize Berkeley as a longtime hotbed of radical politics and the epicenter of student protests for every whacky leftist cause from Occupy Wall Street to animal rights – not a place for a serious speech by one of the liberty movement’s serious thinkers and leaders. But history has a funny way of turning on itself and what many have forgotten is that Berkeley’s reputation as a radical hotbed was cemented by protests about an issue that conservatives and all liberty lovers have embraced with renewed vigor since the Obama presidency began – free speech. Senator Paul’s remarks did not address whether or not Berkeley students should be disciplined for dropping the F-bomb as some of the protests of the 1960s did, rather they addressed privacy and the appropriate limits on government surveillance, serious issues that should be a universal concern of liberty loving Americans. Paul also noted the frightening breadth of the Obama administration’s surveillance program: Accessing financial records under a broad anti-terrorism umbrella, Paul said, the government can tell "whether you drink, whether you smoke, whether you gamble, what books you read, what magazines you read, whether you see a psychiatrist, what medications you take." "I oppose this abuse of power with every ounce of energy I have. I believe you have a right to privacy and it should be protected," Paul said to cheers and applause from what The Los Angeles Times reports was an enthusiastic crowd of about 400. Too many establishment Republicans are inclined to accept that if the government has the technical capability to do something, like say collect the data on every phone call made in America, it should go ahead and do it in the name of a very dangerous notion of what constitutes national security. In Senator Paul’s words by following that logic the nation's surveillance agencies have become "drunk with power" and are running roughshod over the Constitution by prying into the most intimate details of people's lives. More than any other GOP presidential prospect, Paul has worked to broaden the party's appeal by calling for greater outreach, especially to younger voters — "We need people with tattoos, ponytails and earrings" — and by showing up at places Republicans rarely frequent noted the LA Times’ Mark Z. Barabak. In his new book TAKEOVER, do out April 8, CHQ Chairman Richard A. Viguerie dissected what makes Rand Paul such an attractive candidate, and why he can take the conservative message of privacy to a liberal bastion like Berkeley and get a standing ovation this way: Position, Differentiation, Benefits and Brand, or what makes Senator Paul unique. In Mr. Viguerie’s analysis, Senator Paul occupies a unique position or “hole in the marketplace” and as a limited government, constitutional conservative with significant libertarian leanings he appeals to important parts of the voting public that Republicans need and have trouble reaching—Libertarians and young people. We think Senator Paul has it right on both the policy and the need to take this message to the broadest audience possible. If Republicans want to win they need to build a new 21st century coalition and Rand Paul’s message that conservatives are leading the fight for the constitutionally protected rights freedom of speech and privacy is a great place to start. Submitted by bpitas on Fri, 03/21/2014 - 12:44. "Senator Rand Paul accomplished a feat that, as far as Google could tell us, no other Republican has accomplished in years; he received a standing ovation at the University of California at Berkeley." Not to take away from Rand, because he's amazing, but it hasn't been very long since the last conservative got a standing ovation at UC Berkley. Less then two years in fact! As many of us know, the GOP has no chance of winning national office again without embracing people like Rand and Ron Paul, who have a chance of attracting the votes the GOP needs most - independents, young people, and disenfranchised democrats. Losers like Romney and McCain will NEVER get this demographic out to vote, while the GOP base (basically old white people) will vote for whomever they are told to vote for like they always have. Submitted by hrh32 on Thu, 03/20/2014 - 16:00. Aherm, I thought this site was vehemently opposed to Mitch McConnell? Yet your man, Rand, is an enthusiastic supporter. Why is this not mentioned in your article? Very sorry to see this site touting Rand Paul so much. He's right on some things. But VERY wrong on others. Like most libertarians, he's more liberal than CONSERVATIVE. Rand has ALREADY compromised himself with the establishment. There's a good case to be made that the ONLY reason he ran for Senate in the first place was that Daddy decided it was time to retire, but wanted his voice to still be around. So Daddy made a deal with the Establishment to play wing man for Mitt Romney in the debates and help eliminate the CONSERVATIVES in 2012. And now Rand has continued his deals with McConnell, etc. Rand was making calls for Karl Rove in the Florida special election last week. Is this site more conservative or more libertarian? For example, Ted Cruz is much more CONSERVATIVE across the board than Rand. AND Cruz has not already compromised himself with the Establishment. Please be more qualified and do full reporting on Rand on this site. As I said, it is SIGNIFICANT that Rand supports McConnell; it's called COMPROMISING PRINCIPLES FOR AMBITION. Submitted by bpitas on Fri, 03/21/2014 - 13:28. Part of the reason Rand Paul has already made more of a practical impact than his father Ron Paul is that he is willing to play the game of politics, which is a necessity to enact real change. In the case of Mitch McConnell, Rand endorsed him before the more libertarian competitor Matt Bevin announced, and even if that were not the case, I think Rand would have to get McConnell's support in order to have any chance to make a run for the presidency. We all saw what happened in the primaries when Ron Paul ran - the establishment lied about caucus results, cheated and literally changed the rules to make sure Romney was the candidate instead of Dr Paul. Having someone like McConnell owing Rand a favor will pay dividends and there is a good chance Bevin will win anyway. Rand's endorsement of McConnell means nothing to me because I know why he did it, and I have already sent at least $50 to Bevin's campaign to try and help. I hope others do the same.